“Sometimes I’ve got the jungle under my skin”, Merrill Garbus sings on “Es-so”, from the follow-up to her 2009 debut, BiRd-BrAiNs. There indeed seems to be a wildness within Garbus and her experimental music. 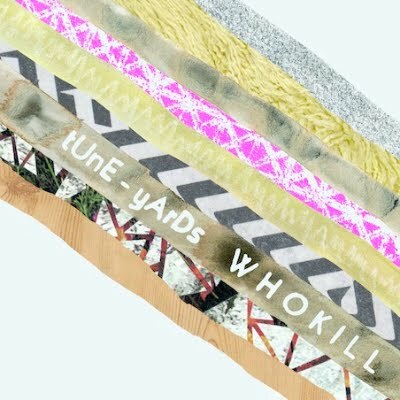 Stylizing her stage-name as tUnE-yArDs and album title as W h o k i l l, Garbus’ disregard for standard syntax befits the haphazard approach to her songwriting; for a joyous madness certainly pervades the hodgepodge of raucous harmonies, spiking horns, rumbling rhythms, and jazzy bass (courtesy of Nate Brenner). The Afro-pop aesthetic and her swooning vocals can, at times, evoke Vampire Weekend — but only if the polished sheen of Ezra Koenig’s compositions had been cut up and obliterated in the midst of some spastic frenzy. On the single “Bizness”, Garbus yelps, “I’m a victim, yeah/Don’t take my life away/Don’t take my life away” — an urgent, desperate plea that is countered by its hypnotic, almost childlike harmonies and video. On W h o k i l l, Garbus serves up ten tracks that are defiantly bizarre yet still irresistible — a rare balancing act that heralds a truly original talent. Buy this at Other Music or iTunes. After the jump, check out the video for “Bizness”.